Today I want to deal with audio metering on the Panasonic GH2. This will help you greatly if you are using the camera itself to record audio, rather than relying on a second digital recorder. Once again, this tutorial is more like “the story so far” in terms of ongoing testing. It caters to advanced users already familiar with PTool and looking to modify the gain options beyond what the factory settings allow. I suggest reading the “GH2 Audio Hacks” thread I started at Personal-View.com last year before proceeding further. Here’s a glossary for reading the data below. dBFS = deciBels Full Scale. “0dBFS” means the loudest level that can be recorded into a 16-bit or 24-bit digital file (and the GH2 uses 16-bit). Hexadecimal = A counting system based on 16 instead of 10, with eleven through 15 represented by the letters A through F.
Now, the most important thing thing when using your level meters is to know what the scale means. The default scale isn’t “bad” but the manual doesn’t help describe it in any useful way to the consumer. Here are some things to know about it. - The level meters (when activated) show eight bars in the left hand side. Each bar lights up when the signal reaches a specific level. - PTool numbers the level meters from left (Level Indicator 1) to right (Level Indicator 8). Unlike the AGC values mentioned in the last tutorial, higher numbers actually mean higher levels here. - The scale is not set conservatively. Once you hit Level Indicator 8, you are smack dab at 0dBFS and may be going over (leading to either limiting or distortion). - The dynamic range that can be recorded in the 16-bit file format that the GH2 uses is 0dBFS to -96fBFS. But as you can see in my previous blog, the lowest users have been able to get the noisefloor so far is around -72dBFS. - Depite an estimated 72dB dynamic range that the GH2 should be able to record, the default factory meters display information about less than the top 30 dB of the scale. - Level Indicators 4 through 8 cover less than 18 dB at the top of the scale. Now, for my personal purposes, there are a few problems with that setup. For starters, it’s useless when evaluating the noise level you are getting in a given environment or when setting your AGC level. By the time you hit Level Indicator 1, the noise level has long since gotten so loud that it will create major problems for your recording. Despite all of the level indicators to this smaller dynamic range, it still fails to emphasize good recording practices. Depending on audio discipline, music studio engineers are often trained to target their general peaks at anywhere at anywhere from -20dBFS to -18dBFS, -14dBFS or (increasingly commonly) -12dBFS. This means that performers have enough headroom to vary their performances, if so inclined, without risking unintended distortion, even when recording without compression. No more than two indicators are needed above this range on the scale because you need one to say “getting hotter but still in the safe zone” and one more to say “you’re really pushing it! But the default scale devotes 3 (out of 8!) to the range ABOVE -12dBFS but is targeted so that it doesn’t let you know when you actually hit -12dBFS. Here’s my first general purpose custom scale proposal for the 8 meters. You’ll notice that two of the most common peak targets (-18 dBFS and -12 dBFS) are specifically targeted and that are only 2 additional indicators above -12 dBFS, with the top set more conservatively (so that you know to back off before you damage your recording). In addition, the scale uses useful intervals and reference points throughout. The first three indicators are useful for measuring noise level (with Level Indicator 3 pulling double duty for measuring quiet dynamics) and are set at 12 dB intervals. The next four indicators are set at 6dB intervals creating a consistent and musically useful way of measuring the dynamics up to the “red zone”. The last indicator ( level indicator 8 ) is 3dB above Level Indicator two and 3dB below 0dBFS. This encourages more conservative handling of maximum recording limits and decreases the chances of introducing artifacts in your recording without realizing it. It also continues the trend of the scale so far (which is so often the case) of using larger intervals at the bottom and smaller intervals at the top. Now I’m not married to the idea of having Level Indicator 8 at -3dBFS so I would appreciate your thoughts on this. It could easily be set to 0dBFS if that’s the preference. What are your thoughts on this scale or suggestions for a different one? Thanks for the article – as a TV and Cinema recording and mix engineer, any info for Cameramen/one-stop-shop shooters on audio is great! One Observation: you mention ‘audio engineers are trained to target their peaks at anywhere at anywhere from -20dBFS to -18dBFS, -14dBFS or (increasingly commonly) -12dBFS’. Thanks for the feedback. I may modify the wording, since I was speaking from a music engineering (rather than film audio) background on that one. I have fairly limited experience with recording audio for film but I’ve been working in music production for nearly 15 years. When recording music, you want more headroom than you do for dialogue recording. You never know when a performer is going to find that extra bit of passion for their performance. I went ahead and modified the section to clear up the context and application of the original remark. Hopefully it’s clearer now that it wasn’t derived from dialogue recording. That scale from 1 to 8 would suit me. Do you have any idea of HEX settings yet? I’ve tried a few but can’t get them sorted to follow your scale. Thanks. Yes, I’ve sent the closest values I’ve found so far to Nick Driftwood and he’s planning to include them in the Quantum X Sedna patch. I’ll send you a message with them on Personal-View.com. Hi, I’ve applied DrewNet Trial 8. I checked it and it has volume settings checked; I checked the AGC setting. What should I see when Audio is selected? I only see 4 levels. Is that correct? In other words, how can I tell if the audio piece “took”? Thanks! If DrewNET was applied, then the audio settings were included. There have been no reported instances where a Firmware flash only changed “some” of the settings that were checked in PTool. You can tell if the settings as a whole were applied by the change in record times for the video modes as compared to what you previously had. There is no visual indication that the audio settings, specifically, have been applied – it can only be inferred from the differences in the behavior in comparison to a setting without the audio changes applied. 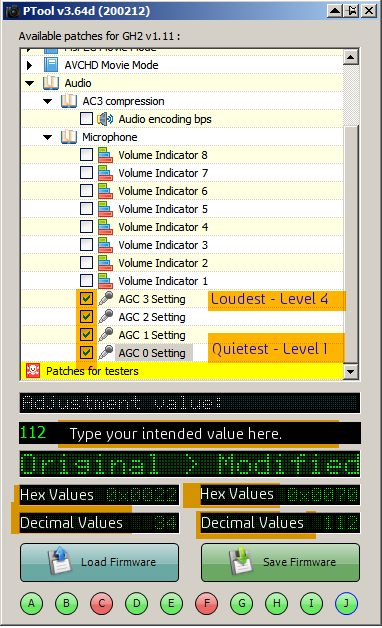 One simple check is that Mic Level 1 should be MUCH quieter than the stock settings. These metering settings and AGC settings have been included in every major Driftwood release for the last year that I am aware of (starting with Sedna), as well as in lPowell’s Flowmotion 2.02 and the bkmwcd’s settings for several months.